Good evening! I have spent the long weekend cleaning and organizing (so NOT fun but it feels good to have it done!) so I am exhausted and I have no nail art MANIc Monday post for you tonight. I do have a gorgeous Nail of the Day to show you though! Cult Nails Morning Glory is from the In The Garden Collection. It is a gorgeous berry/magenta/purple with a lovely wax finish. 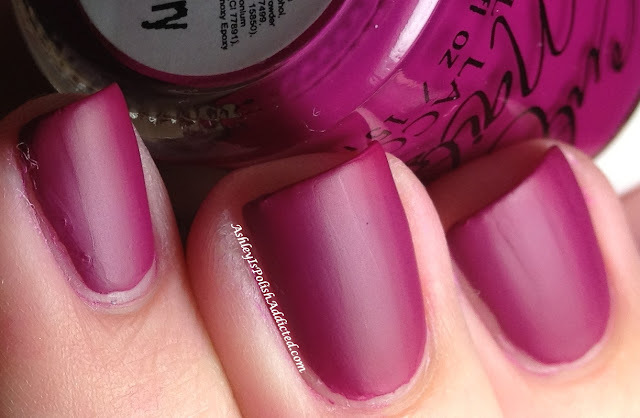 The formula on this one was amazing and I only used one coat for the photos (and it dried super fast!). I wore this for Part 1 of my cleaning weekend and also had excellent wear with it which surprised me because I used no topcoat and these types of finishes generally don't have great wear time. Stupendous job, Cult Nails! Please excuse the doggy hair - it's impossible to avoid it completely but they're worth it! Isn't it gorgeous!? There are a couple more I want from this collection as well! Cult Nails polishes retail for $12 and are available at Cult Nails website and at Overall Beauty! You can visit Cult Nails on Facebook and Overall Beauty on Facebook as well to stay up-to-date on re-stocks and other information. I love that color! wow!